Eagles of Empire and Economic Terrorism: Are Vulture Funds Instruments of US Foreign Policy? Hours after the US Embassy in Buenos Aires issued a security warning to US citizens either already inside or traveling to the South American country, Argentinian President Cristina Fernandez de Kirchner accused the US of plotting to overthrow or kill her. Speaking during a television broadcast from the Casa de Gobierno on September 30, she explained that “if something happens to me, don’t look to the Mideast, look north” to Washington, DC. She told the Argentine people not to believe anything that the US government was saying, even going as far as dismissing the ISIL/ISIS threat as a US bogeyman. Addressing the growing mythology and international fixation concerning the ISIL in Syria and Iraq, Argentina argued that terrorism is rooted, fuelled, and nurtured through injustice and disparity in the global system. 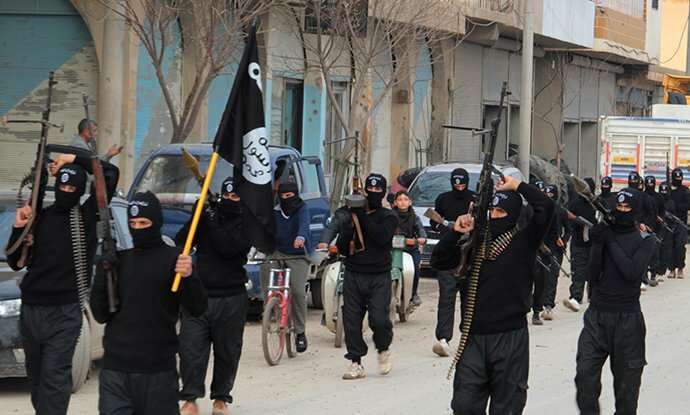 Groups like the ISIL and al-Qaeda are merely the symptoms of something much deeper and much worse. Dismissing Washington’s military methods as unproductive and illogical, Argentina held that to ebb the vicious cycle of violence the world had to address the root causes for the creation of groups like the ISIL and the conditions that make people lose hope. Not only was Argentina indignant on September 24, but it was defiant at the UN against the dominant structures of the global system. The Argentines were upset with the US and ten other countries that voted against the establishment of a universal legal formula for dealing with sovereign debt a few days earlier, on September 9. President Kirchner derided the neoliberal economic policies of the Bretton Woods Institutions—the World Bank and International Monetary Fund (IMF) – and essentially the Washington Consensus. 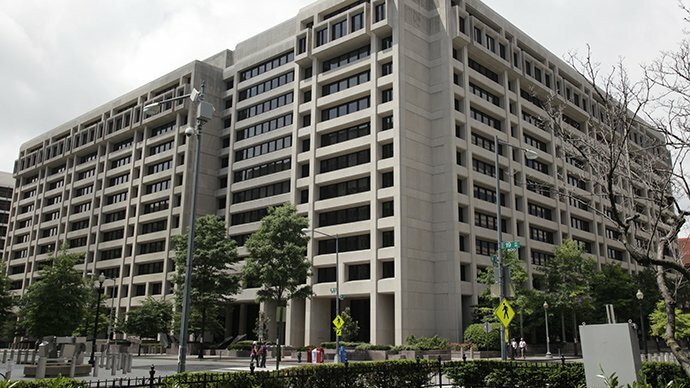 She explained how previous Argentinean governments had followed the recipes and “conditionalities” of the IMF, saying that the IMF’s economic medicine was what economically ruined Argentina in 2001. So who are the “economic and financial terrorists” that were being condemned by Argentina? Since its economic crisis in 2001, Buenos Aires renegotiated its debts, in 2005 and 2010, through new repayment schedules and a reduction of the face values of the debt(s) by 70 percent to about $13 billion with 92.4 percent of its creditors. A 7 percent minority of the bondholders, however, held out and rejected Argentina’s proposals. These holdouts are hedge funds that have been dubbed as vulture funds. Like real vultures circling and hovering around a dying carcass these bondholders strike distressed economies and take advantage of fiscal crises to make windfall profits. These predatory hedge funds and private equity funds operate by buying debt at bargain discounts and wait for distresses and defaults. Their strategy is to profit off the defaults and to amplify their profits through maximizing the interest returns on what debtors owe them or to use litigation to sue debtors for even larger amounts that what they would have received if the debt was paid in full. Griesa not only awarded the holdouts over 1,600 percent interest on what was owed for a five-year period, but he also blocked Buenos Aires from making its debt payments to its other bondholders until it paid the vulture funds the full recalculated sum. According to the Argentines, Griesa’s “new judicial interpretation implies that a sovereign country cannot pay creditors who have accepted an exchange offer unless holdouts from the exchange offer are paid in full, effectively granting privileged conditions to holdout creditors.” So a $539 million payment was frozen by the Bank of New York Mellon Corporation, which resulted in a legal appeal from other bondholders on August 15. 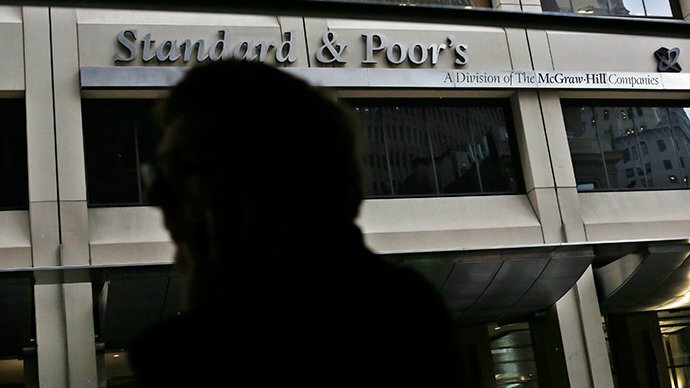 Standard & Poor’s declared Argentina in default on July 30, after Buenos Aires was prevented from making its debt payments. Not only were investors scared away and Argentina’s access to global capital markets hurt, but the threat of default at the end of October 2014 also put additional pressure on both Argentinean economy and the Argentine peso. The petro-politics of an energy war are part of the equation. It was not an accident that Cristina Kirchner finished her speech, during the discussion on terrorism at the UN Security Council, by turning to the US delegation and saying that her country had vast hydrocarbon reserves that could end up becoming a curse because of the problems that go along with them. Kirchner was tacitly saying that she feared Washington would meddle in Argentina, as it has done elsewhere, to control its energy resources. 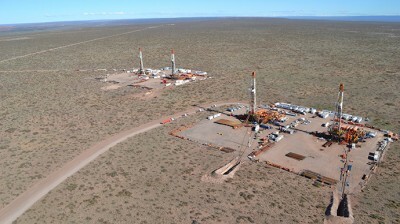 It is also worth noting that Russia is Argentina’s partner in its project to become a natural gas exporter. Before Kirchner spoke at the UN, Russian President Vladimir Putin had paid a state visit to Argentina during his tour of Latin America. 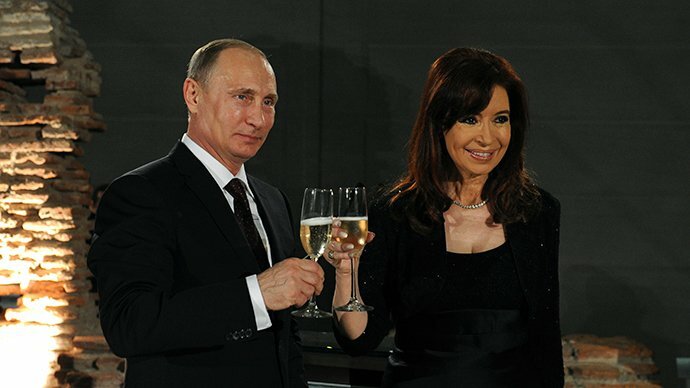 In Buenos Aires he announced that Argentina was one of Moscow’s strategic partners. Moscow and Buenos Aires signed important trade deals and agreements on energy, information, and military cooperation on July 12. Months later, via a teleconference, Putin and Kirchner would inaugurate the broadcasting of RT en Español (RT Spanish) or RT Actualidad in Argentina on October 9—this is clearly a move to challenge US influence and interference in Argentina. Days after Kirchner talked at the UN, Argentina and Russia both signed an important bilateral energy contract for Gazprom to cooperate with YPF to explore and develop Argentina’s natural gas reserves. Gazprom had already established ties with Argentina before this when it secured a contract to export Russian natural gas to Argentina in 2013. The Argentinians have cried foul. They have been upset by statements made beforehand in the US about Argentina defaulting and accused the US legal system and federal government of complicity in an attempt to economically destabilize the Argentine economy. After refusing to submit to the court rulings, Argentina tried to negotiate with the vulture funds in July 2014. The Argentines would eventually reject the court-appointed mediator, Daniel Pollack, as incompetent and biased. The deadlock in the court-mediated negotiations eventually led to a breakdown when Pollack made a statement against Argentina. The Argentine government’s attorney, Jonathan Blackman, protested that Pollack’s July 30 statement about Argentina defaulting was “harmful and prejudice to the Republic in connection with the market and in connection with other persons, such as holders of credit default swaps.” On August 1, the Argentine government said that it had lost confidence in the mediation. After this, Griesa blocked Argentina from paying its other debts and an emergency court hearing was held in Manhattan on August 8. During all this time Buenos Aires had been asking the US government to clarify that its domestic court could not hold Argentine’s independence as a sovereign state hostage. Washington did nothing. The week prior to President Kirchner’s appearance at the UN, her government was angered when a US official said that Argentina was in default. Argentina has viewed this and the US government’s refusal to intervene as an act of complicity. On August 7, Buenos Aires even asked the International Court of Justice to hear its case against Washington for allowing the US legal system to violate its independence as a sovereign state. When the Argentine National Congress passed the Sovereign Debt Payment law on September 11 to bypass the banking system in the US and to start repaying its debts locally or in France, Judge Griesa declared it illegal. After Griesa threatened to hold Argentina in contempt of court, Argentine Ambassador Cecilia Nahon sent US Secretary of State John Kerry a letter warning Washington that it would be responsible for the consequences of the US court’s rulings on Buenos Aires. The vulture funds are being used to blackmail Buenos Aires as an instrument of US pressure. This was hinted at by Kirchner while she spoke at the UN. No wonder that Kirchner had alluded to Washington as a supporter of economic terrorism while she spoke there. 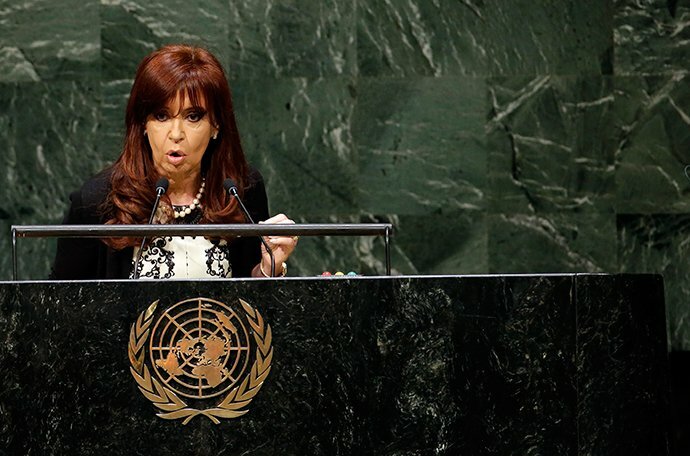 Later Cristina Kirchner spoke more directly. “I’m not naive, this is not an isolated move by a senile judge in New York,” Kirchner has even publicly stated about the fiasco. In Kirchner’s words, these hedge funds “look a lot like the eagles of empires” that are doing Washington’s bidding. World leaders are picking up on this economic terrorism and blackmail. This is why Bolivian President Evo Morales has referred to the US sanctions against the Russian Federation as an act of economic terrorism. Mahdi Darius Nazemroaya is a sociologist, award-winning author and geopolitical analyst.